(NaturalNews) Remember when Hillary Clinton said she was "horrified" by Donald Trump's refusal to pre-announce his acceptance of the election outcome? 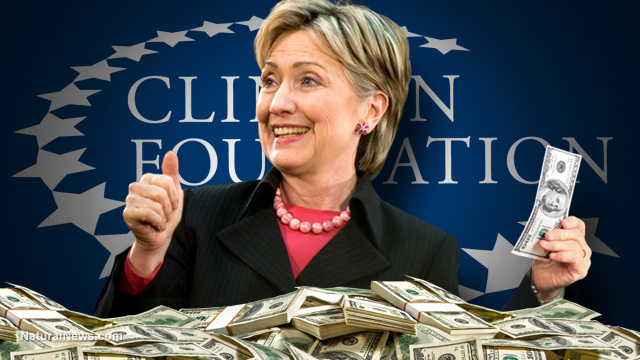 His stance was "a direct threat to our democracy," Hillary sternly claimed during the debate. Now, she's carrying out her own threat to democracy, using Jill Stein as a convenient puppet to question the election outcome and demand a recount in three states: Wisconsin, Pennsylvania and Michigan. 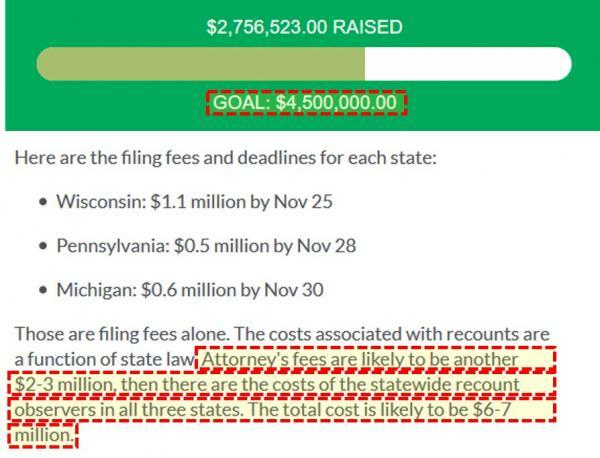 By "recount" they mean "steal the election," of course. The same election fraudsters who plotted from day one to destroy Bernie Sanders when the timing served them best has now decided their best hope of stealing the election is to try to overturn the will of the voters in key battleground states. Oh, and as all this is happening, the Washington Post is now claiming the entire election was stolen by the Russians... or Bigfoot... or aliens or maybe even the Loch Ness Monster. This is what it has come to: WashPost reporters donning tin foil hats and proposing conspiracy theories so loony that they would have been categorized as "derision" if the roles were reversed and Trump supporters were claiming election theft. 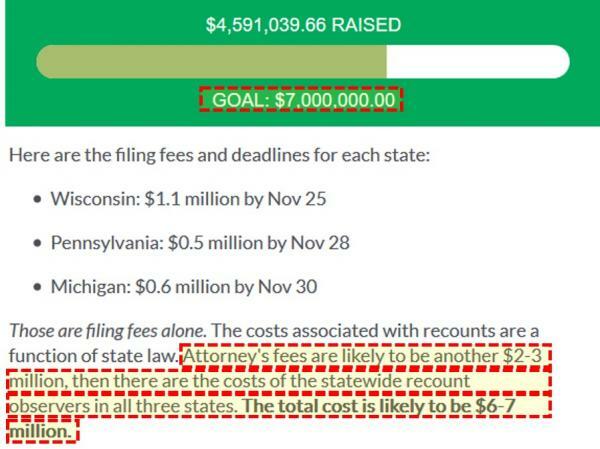 What Jill Stein has stumbled upon here is a whole new way to scam voters out of millions of dollars: Just LOSE elections, call your opponent an evil monster, then rely on gullible, brainwashed loyalists to pay you millions of dollars while claiming you're working on a "recount" for the "integrity of democracy" ... even when you despise democracy. 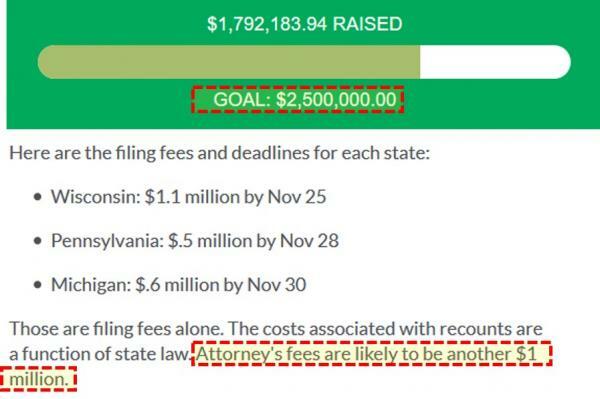 If the money keeps flowing in, just raise the "estimated attorneys' fees" and pocket the excess cash. With Donald Trump already at 306 electoral votes, a recount effort would have to overturn the election results in all three states in order to deny Trump 270 electoral votes. The odds of that happening are extremely remote. Sure, they'll attempt some fraud during all this, and the radical left is already death-threating electoral voters to try to make them change their votes. I have no doubt a few electoral voters will succumb to the death threats and change their votes to Clinton, but it won't be enough to matter... not even if they manage to overturn Michigan's final count. When the radical left realizes their efforts to steal the election won't work, they will ramp up their next plan: Committing mass violence while attempting a popular uprising "takeover" on January 20, 2017. I've been in direct contact with an investigator who has infiltrated the organizational meetings of the radical left. That person tells me the radical left is working diligently on multiple strategies, including an attempted assassination of Donald Trump and an attempted takeover on Inauguration Day (January 20). I fully expect they will swarm and occupy the U.S. Capitol on that day, after which the new President Trump will simply order the 1,000 U.S. Marines stationed there to "clean 'em out." Having already failed to steal the election, when the radical left fails in their efforts to overthrow the government, they will then resort to guerrilla terrorism tactics across America, joining with radical Muslim terrorists to bomb malls, government buildings and transportation hubs. They will carry out mass shootings and slayings of innocent Americans, hoping to cause maximum chaos to derail the Trump administration. It also suggests a whole new use for all the FEMA camps across the country: Use them to incarcerate the radical left-wing terrorists who are caught trying to instigate violence.